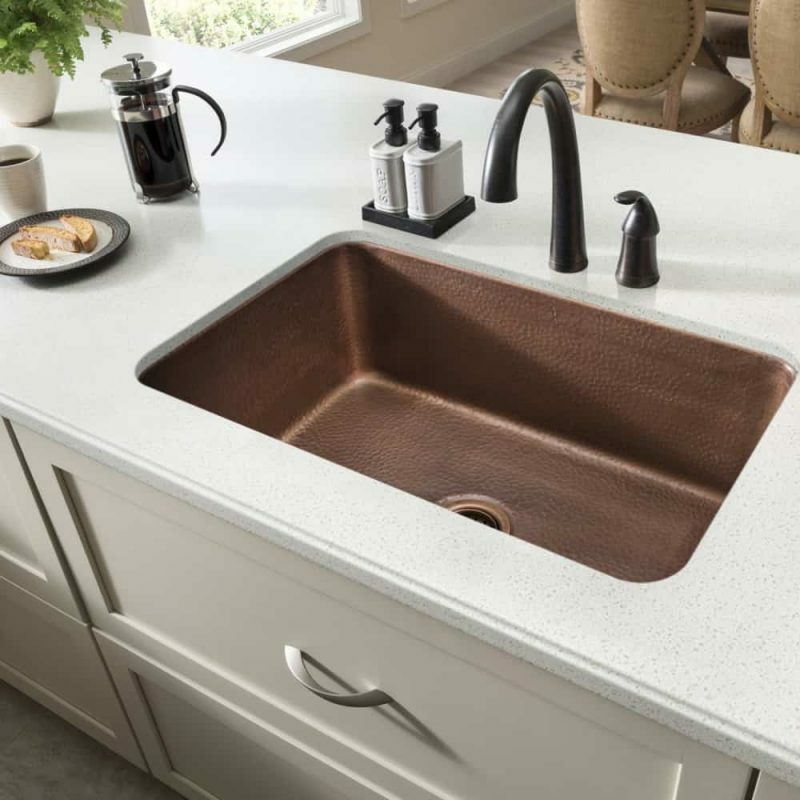 This page is designed to help you learn about the many different materials and styles being used in today’s kitchen sinks. It’s divided into two parts. The first part discusses the various materials used in kitchen sinks, and the second part is dedicated to designs and styles. For the first-time sink shopper, the huge assortment of materials can make buying the right sink more difficult than it needs to be. This section discusses the various materials used to make kitchen sinks. Stainless steel sinks are among the most popular on the market. 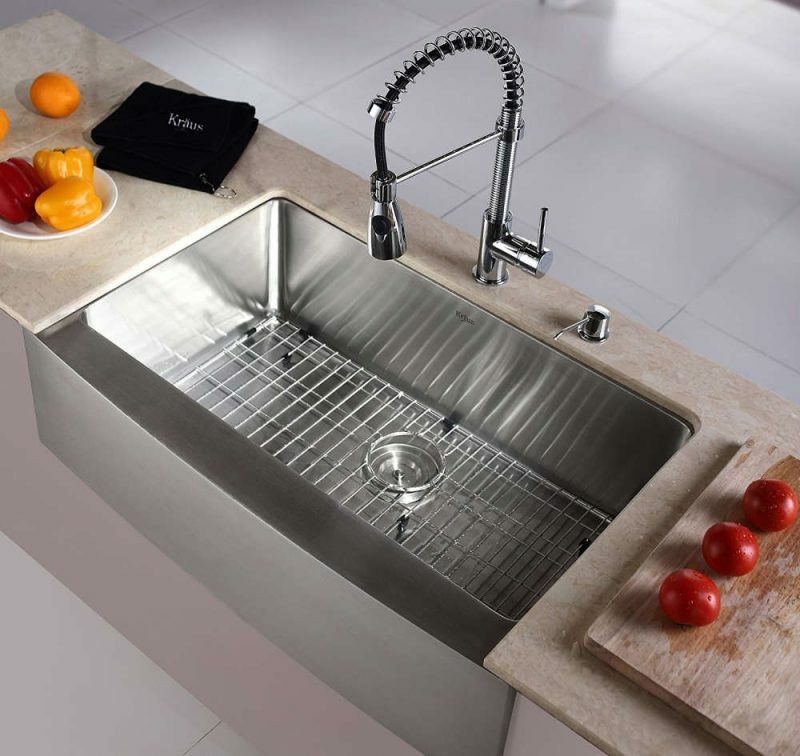 According to leading sink manufacturer Franke, 70% of all sinks are made using stainless steel. Click here to check out our full guide to stainless steel sinks. Compared to other materials, stainless steel tends to be inexpensive, although designer brands like Kohler and Blanco can still easily cost upwards of $300. The versatility of stainless means that stainless steel sinks are available in a variety of installation types (undermount, top mount, etc). Stainless steel is classified in terms of gauge. Lower gauge steel is heavier; higher gauge is lighter. Most sinks fall within the 15 to 24 gauge range, and the majority of residential sinks are usually between 18 and 22. In terms of inches, this means the steel sheeting used to make the sinks has a thickness that ranges from .048″ to .030″. Conventional wisdom (and common sense) seems to indicate that a heavier gauge steel makes for a better sink, but this isn’t always true. Testing by Consumer Reports shows that the gauge had very little impact on the overall quality of the sink. However, a heavier gauge sink can be slightly more resistant to denting and is typically less noisy. 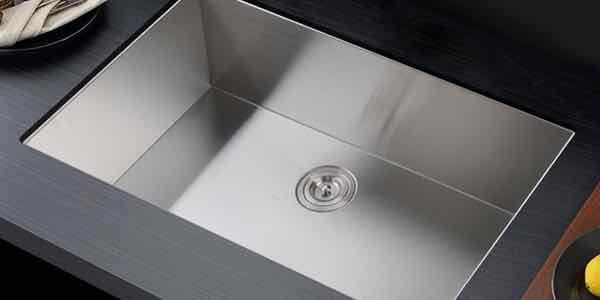 Stainless steel tends to be a louder than other materials, although many sinks feature a spray coating or padding to help reduce the noise. While overall very durable, stainless steel kitchen sinks can scratch more easily than other materials. Stainless sinks also tend to show water spots more clearly, and it can be difficult to keep them looking immaculately clean at all times. However, they offer excellent resistance to heat and stains. See the highest-rated stainless steel sinks on Amazon. When people talk about composite kitchen sinks, they’re usually talking about a granite or quartz composite. Composite sinks are made by combining crushed granite or quartz with a resin filler. The mixture varies depending on the product and manufacturer, but it’s usually around 80% stone and 20% resin. Click here to read our complete guide to granite composite sinks. This combination produces a material that has many of the same aesthetic qualities of real granite or quartz without the maintenance and durability issues associated with those types of sinks. 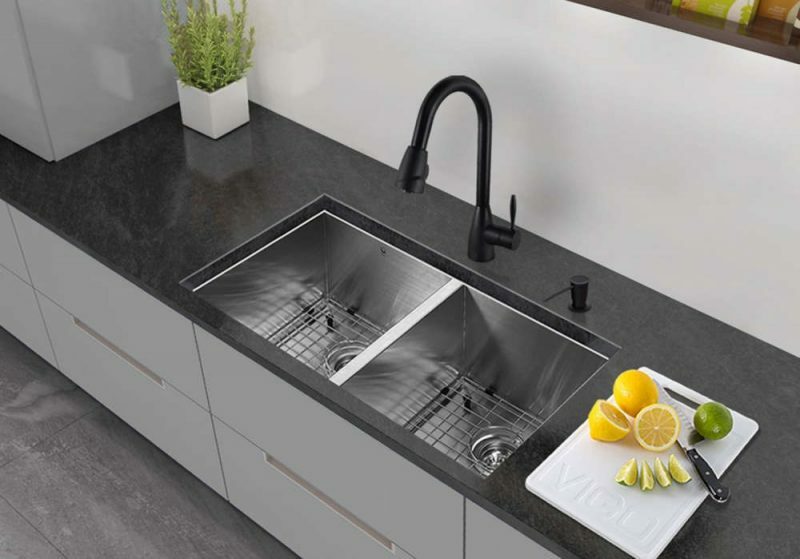 Both varieties of composite sinks are tough and highly resistant to stains and scratching, but as a general rule granite tends to hold up better than quartz. In fact, some manufacturers claim that granite composite sinks are the most durable and long-lasting sinks available. Click here to read our comprehensive copper sink buyer’s guide. Like stainless steel, the thickness of copper sinks is measured in gauge. And, like stainless steel, thicker copper is less noisy and more resistant to denting. Copper kitchen sinks are largely handmade by craftsman. This gives them a charming handcrafted look, but also means there can be a wider range of quality on the market than you’ll find with other types of kitchen sinks. Common problems include size variation (larger or smaller than stated specs) and improper drainage. This is why it’s important to do your homework and make sure the manufacturer stands behind their product with an uncomplicated lifetime warranty. 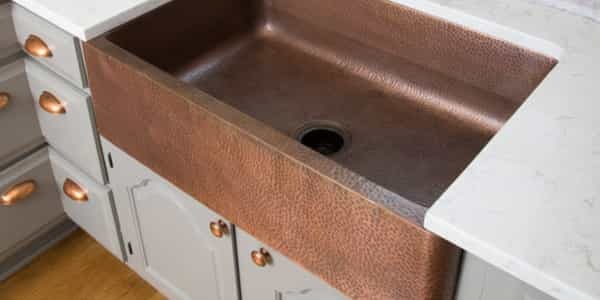 Copper sinks develop a natural finish known as a patina. This is the same process that causes a shiny copper penny to develop a deep brown color over time. While there are ways to slow down the patination process, it’s difficult to stop it entirely, which is why most manufacturers recommend embracing this quality of copper rather than trying to fight it. 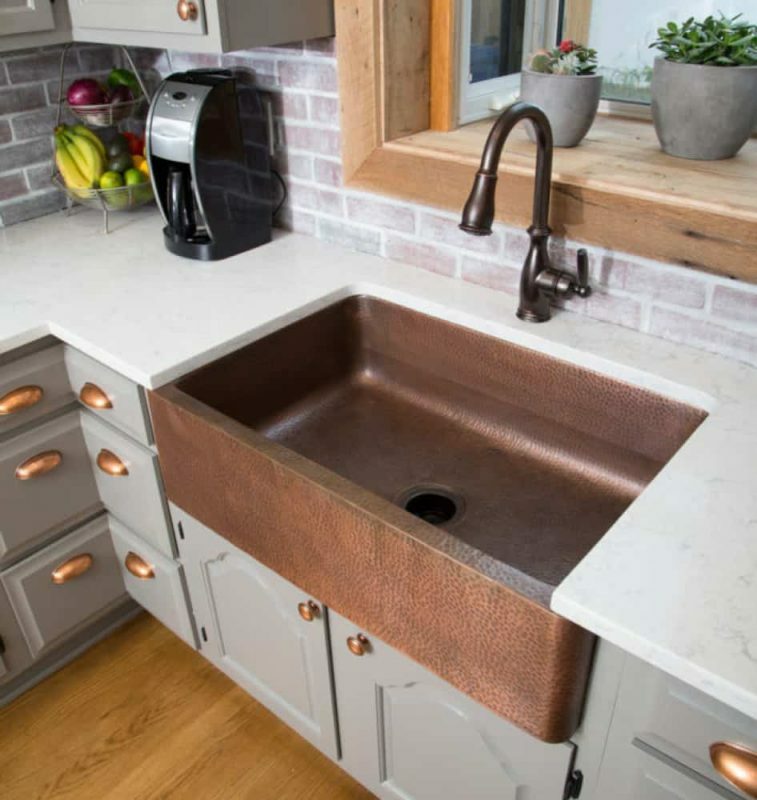 Despite misconceptions, copper kitchen sinks are no more difficult to maintain than other common sink types. A well-made sink shouldn’t need any special maintenance beyond rinsing after use and occasional deep cleaning with soap and water. Check out the best-selling copper kitchen sinks on Amazon. Cast iron is one of the oldest materials used for kitchen sinks and is still very popular today. The bright, glossy enamel finish appeals to many homeowners and can easily last for decades. Click here to read our complete guide to cast iron sinks. Like the name implies, cast iron sinks are made by casting iron. Since bare iron is extremely prone to rusting, cast iron sinks receive a heavy porcelain enamel finish. If you were to strip the enamel off of a cast iron sink, it would have the same rough texture as a cast iron skillet. The enamel finish used on cast iron sinks is extremely tough and does an excellent job resisting stains and scratches. It’s important to understand that the porcelain enamel finish used on cast iron sinks isn’t merely paint–it’s actually melted glass that has been fused to the bare iron. Don’t let the “glass” part worry you–modern enamels are incredibly hard and are well suited to the daily wear and tear seen by the average kitchen sink. The smooth, glassy finish on cast iron sinks is typically very easy to keep clean and is not as likely to show spotting from water. Porcelain enamels also have good resistance to light and fading. Cast iron does have some drawbacks. For one, it’s heavy. An average-sized iron sink can easily weigh 100 lbs or more, which is 2-3 times as much as most stainless steel sinks. This can make installation more difficult, especially in the case of undermount sinks that require additional supports to hold the sink in place under the counter. Cast iron can be much more expensive than stainless steel, with most cast iron sinks starting out in the $300 range. Additionally, the enameling of a cast iron sink can chip, and if the bare iron base is exposed it will quickly begin to rust. But, as mentioned above, modern porcelain enamel is strong (in many cases more so than metal) so this shouldn’t be a large factor in your decision-making process. 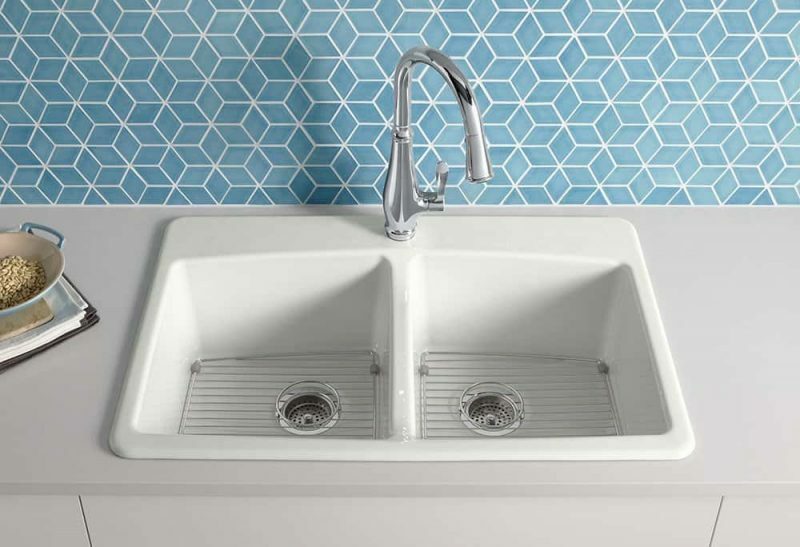 Fireclay sinks are made by molding a ceramic clay into the shape of the sink and allowing it to dry at a high temperature for a period of up to 40 hours. Once the clay has dried, the porcelain enamel is applied and the sink is places in a tunnel kiln at an extremely high temperature (in some cases higher than 2000⁰F) for a period of around 20 hours. Click here to check out our complete guide to fireclay sinks. This has the effect of fusing the enamel to the clay while greatly increasing the strength of both. However, fireclay isn’t indestructible and the enamel can chip from the impact of a dropped pot or glass. Fireclay can also be more prone to cracking than other materials, although proper installation and care minimize this risk. Fireclay kitchen sinks fall on the expensive end of the spectrum. Small, single-bowl models start at around $400-$500, while larger models can cost $750 and up. 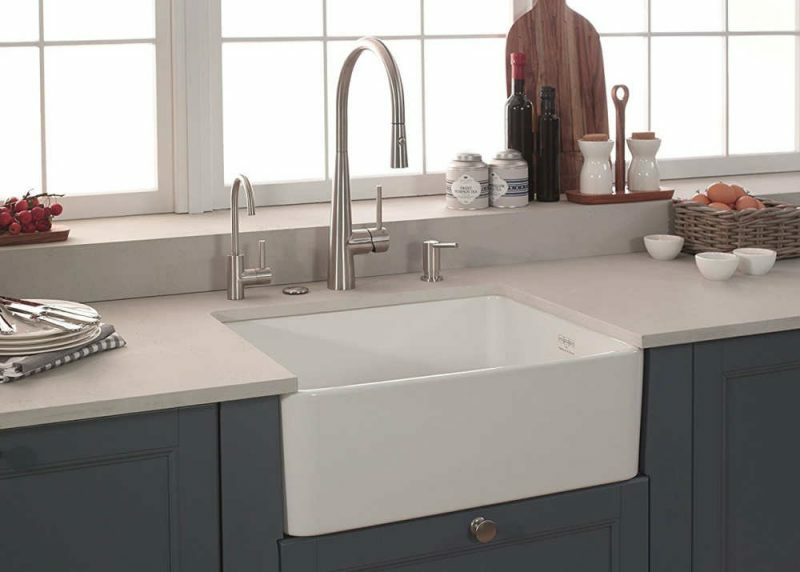 Although fireclay sinks come in a wide variety of styles and installations, the material is most commonly associated with farm sinks (also known as farmhouse or apron sinks). 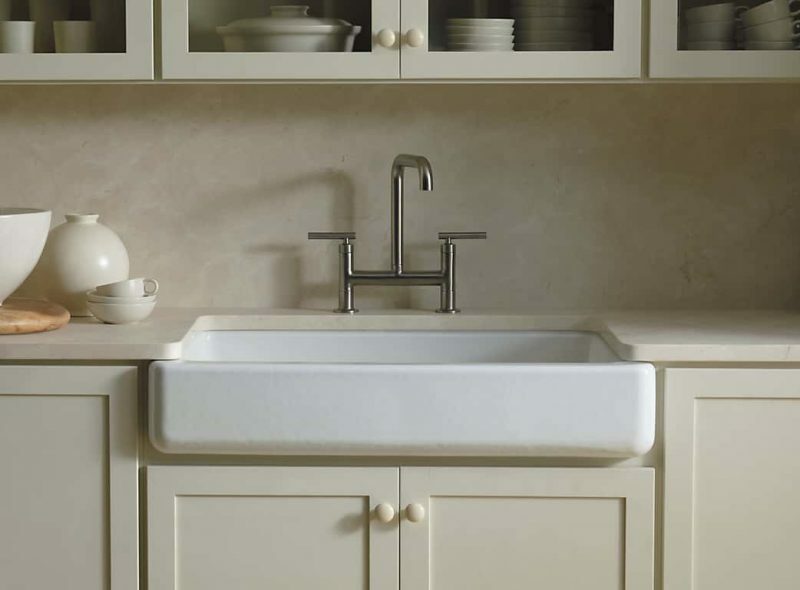 Many people choose fireclay farmhouse sinks for their traditional but timeless styling. The materials discussed above are among the most common used in modern kitchen sinks, but there are many more. Glass, solid granite, and marble are just a few of the more exotic materials being used to make kitchen sinks. If you’re considering one of these less conventional materials, it’s a good idea to do your homework to avoid buying a sink that has durability or maintenance issues you didn’t anticipate. Kitchen sinks come in a number of basin configurations and installation types. It’s good to familiarize with this information before you start shopping. A single bowl sink has–as you may have guessed–just one basin. While many homeowners assume that having more bowls is better, this isn’t always the case. Single basin sinks are usually available in compact sizes, making them ideal for situations where space is at a premium. And the basin of a single bowl sink is obviously going to be bigger than a double bowl sink designed to fit into the same space. A larger basin can make cleaning large dishes such as pots, oven trays, and slow cooker crocks much easier. Cleaning a single bowl kitchen sink is going a be a bit faster due to a reduced number of corners and edges, and single bowl models are typically cheaper than equivalent two or three bowl varieties. 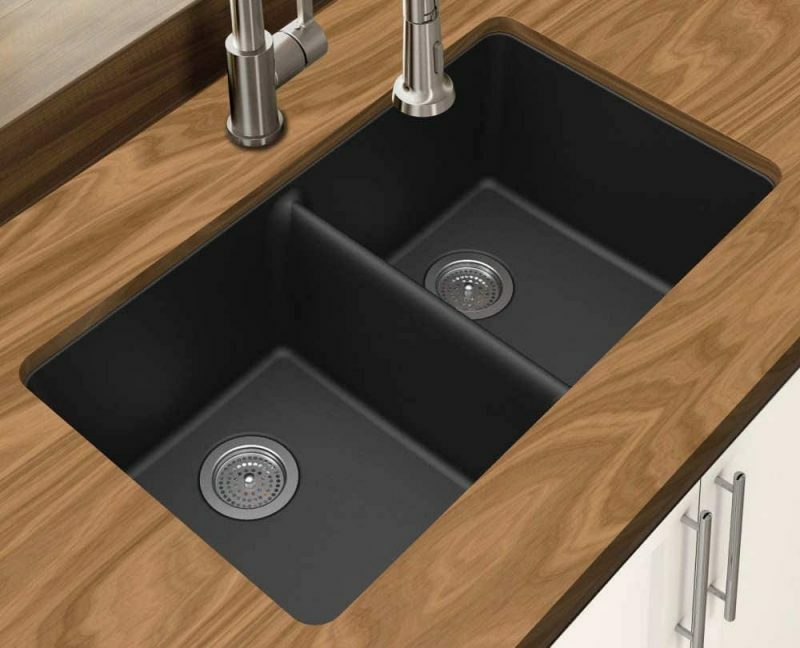 Read our full article about single bowl sinks. The majority of modern kitchen sinks feature two bowls. In most cases, a double basin arrangement is ideal because of the flexibility it affords the user. However, if you do a lot of cooking that involves larger dishes, you’ll need to make sure that the basins of your sink are big enough to comfortable wash them. There’s nothing more frustrating than struggling to clean a large stockpot at the end of a long day of cooking. Double bowl sinks come in a wide array of configurations– two equally-sized bowls of the same depth, two equal bowls of different depths, unequal size bowls, etc. The right setup for you will depend on what you do in your kitchen, so take some time to consider your options before making a purchase. The defining characteristic of a farmhouse sink is a large forward-facing section that replaces a portion of the counter. 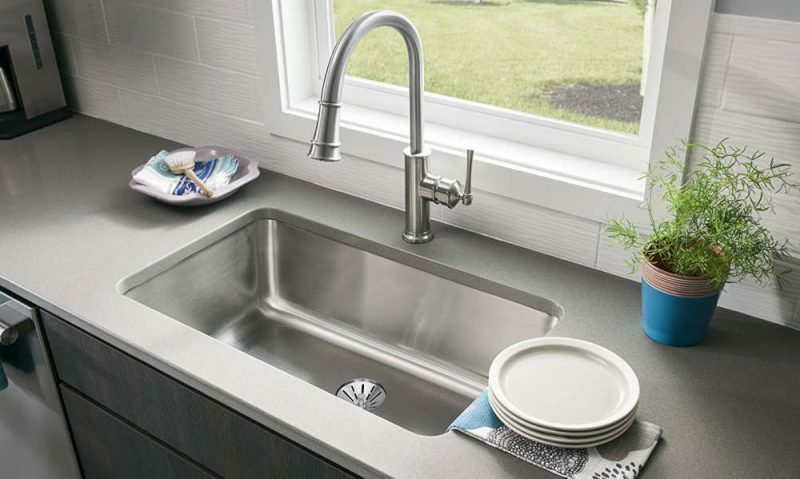 Farmhouse kitchen sinks (also known as apron front sinks) are often the choice for people seeking a traditional or country-style design, although there are a number of stainless steel and composite models available that are designed with an eye towards the modern kitchen. 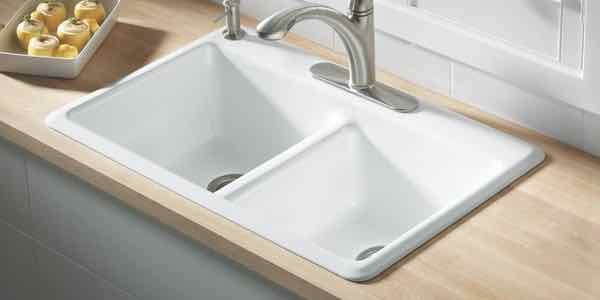 Farmhouse sinks are available in single and double basin varieties, although single bowl sinks are the most common. 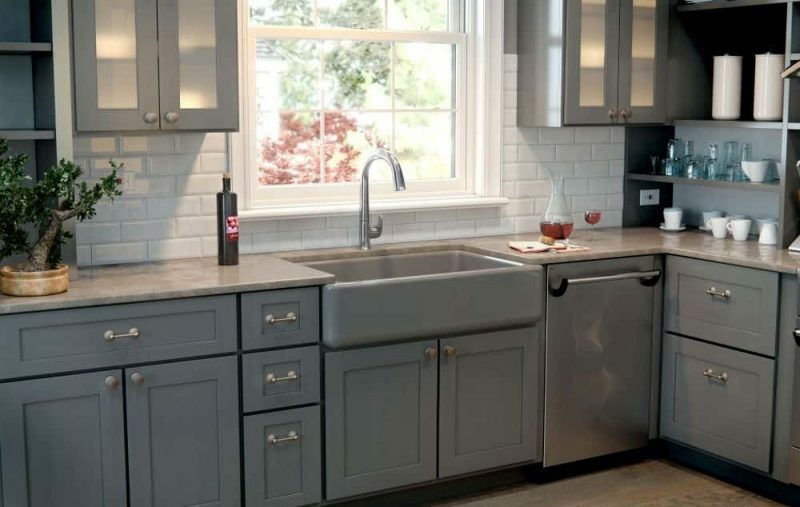 While stylish, farm sinks tend to be on the pricey side and often require much more work to install than other sink types. 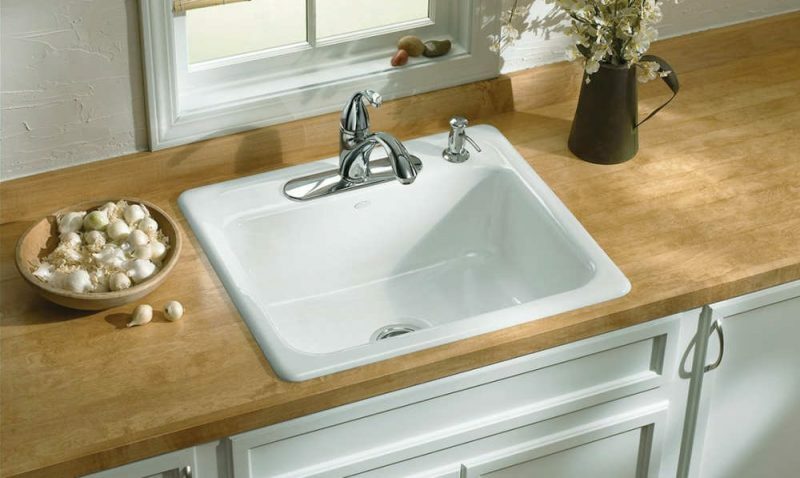 In many cases, the counter must be designed specifically to accommodate the installation of a farmhouse sink. 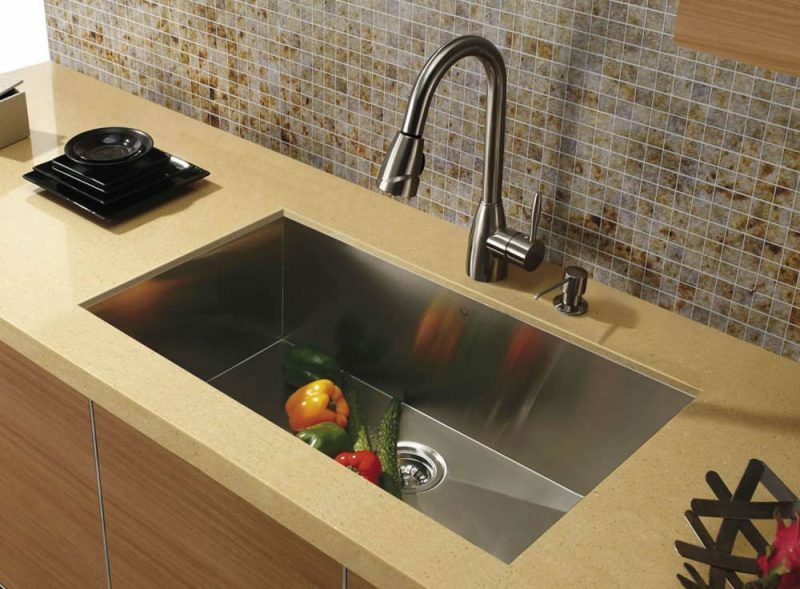 This style of kitchen sink is designed to be dropped into a hole in your counter top. Top mount kitchen sinks almost always have a rim or lip that hold the sink in place and creates a finished look. Top mount sinks–also known as drop-in sinks–are relatively easy and inexpensive to install. The lip of the sink reduces the need for an internal support system under the counter, making this type of sink a good choice for do-it-yourselfers or people on a budget. 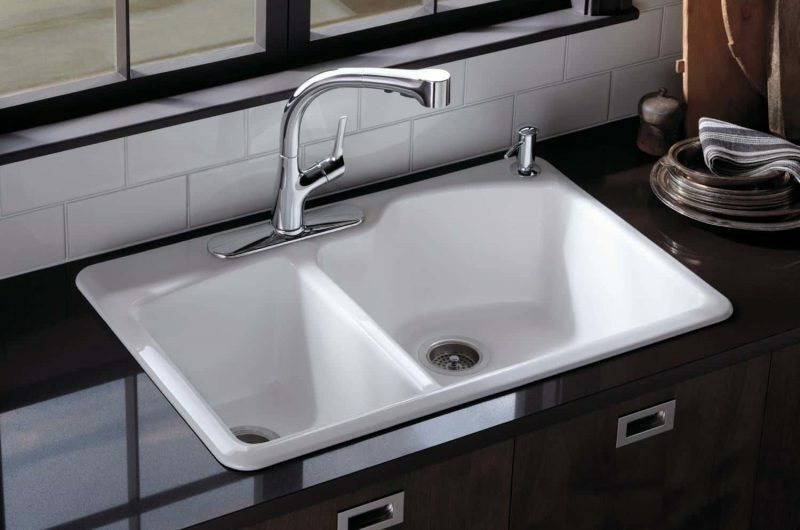 However, top mount sinks don’t have the sleek, modern appearance of undermount sinks (see below) it’s easy for the area between the lip of the sink and the counter to accumulate scum and dirt. An undermount sink is mounted underneath the counter. There is no lip or rim, which means that the edge of counter drops off directly into the sink basin. In addition to providing a clean, modern look, this feature makes for less work when cleaning because debris can be wiped straight into the sink. 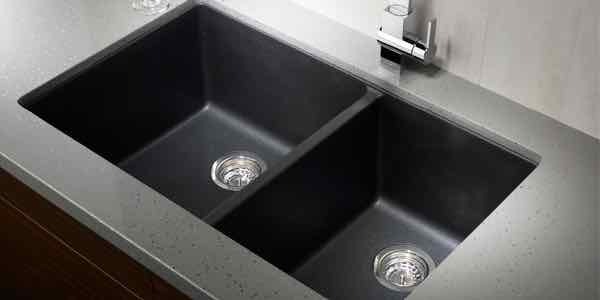 Unlike a top mount sink, undermount models don’t have grooves and crevices where food can accumulate. While undermount kitchen sinks look great and are easier to keep clean, they have some distinct disadvantages over top mount sinks. One of the biggest drawbacks is cost. Undermount models require more work to install because the sink must be glued to the underside of the counter. Stainless steel sinks are typically light enough to work with just glue, but heavier sinks (like cast iron or fireclay) need some sort of internal support system. Most undermount sinks are not designed with space for faucets and attachments, so you’ll need to have holes cut into your counter top to install these components. Check out our complete guide to undermount sinks.